It is obvious by looking at this door that the letter slot on the left harkens back to a pre junk mail era. Back to when people actually got letters. There would be little chance of it holding up to the onslaught of catalogs, flyers, bills and such that arrive daily now. It also refers to when this house was a single family home, not a series of apartments. What really caught my eye though was the iridescent glass-like doorknob glinting in the early light. It had the loveliest shades of purple in it. It seemed so fresh and shiny against the worn wood of the door, the slapdash paint job revealing the previous colors underneath. I like that there is the ghost of a keyhole under the knob, letting the viewer know a tiny bit about the changes the door has undergone. It is like a little footnote. What a wonderful door. 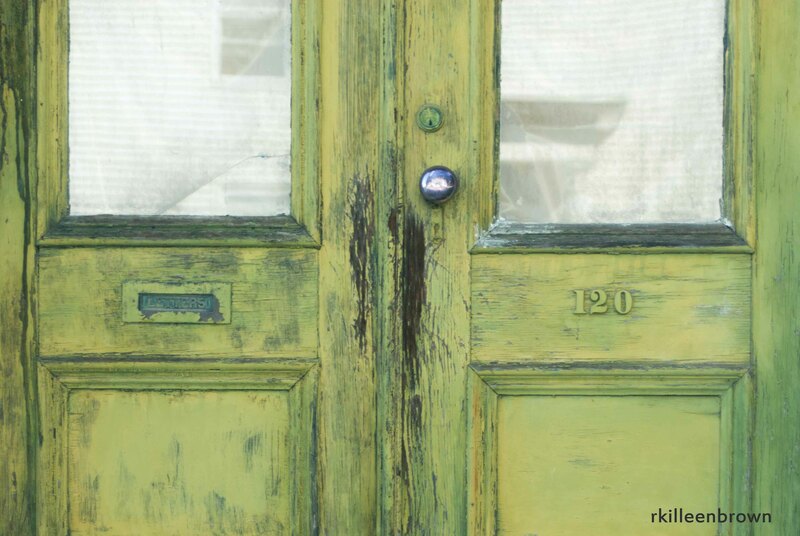 This entry was posted in Photographic Musings and tagged architectural details, old doors by rkb665. Bookmark the permalink.